If you eat meat, someone is killing for you. My chickens have a way better life than any bird callously raised in a factory. I'm pulling feathers off. Denali is eviscerating at right. Mark is carrying a bucket of dressed chickens. Bruce is behind Marc tending the big pot where freshly beheaded chickens get dipped to loosen their feathers. Having grown up in a small city on a bus route where the air never smelled as good as when we went camping, raising backyard chickens is not in my paradigm. I had done both, and added “husband” to the short list of unfamiliar creatures I was expected to nurture, feed and love with little experience. The localvore movement swept me away into a chicken odyssey that cold night in January. After much investigation I got seven pullets (5 months old) from a new chicken friend. Four of the birds turned out to be roosters. The only place for loud, aggressive, feed-eating, non-egg producing roosters is — the stew pot. My good friend Denali joined my chicken exploits, and in her inimitable Denali way, immersed herself in chicken husbandry. 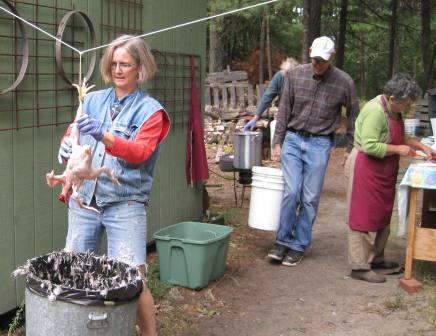 She organized this butchering party to eliminate roosters and avoid consuming factory-raised meat. What I love about raising chickens is the intimate connection to life and my food. I wish I’d raised chickens alongside of my children. It offers a plethora of experience, knowledge chores and family bonding opportunities. BC — before chickens — my chicken knowledge started and ended at the grocery store. I’m still at a loss when they act sick. I have friends, Internet resources and books to guide me. I don’t worry about my ignorance so much. I’m an able chicken raiser. It is WAY easier than raising able children and dogs. As for the husband — he’s in a class all of his own. This entry was posted on September 14, 2010 at 6:37 am and is filed under chores, Food and children, localvore. You can subscribe via RSS 2.0 feed to this post's comments. Ive raised my own fowl as well.Nothing is as satisfying as knowing how your food is raised and what exactly goes into it.Enjoy your adventures in raising chickens!! Tonight we had a slowly roasted rooster that was butchered at Denali’s. It was *excellent*! Thanks for the reminder. I just put Big Red in the crock pot. And eat cows from factory farms? Their lives were MUCH worse than Big Red’s.